Wildlife Heritage Foundation of New Hampshire – DISCOVER WILD NH DAY APRIL 29th! DISCOVER WILD NH DAY APRIL 29th! The Wildlife Heritage Foundation of NH will hold its annual raffle at Discover WILD NH Day on Saturday, April 29th. The raffle will feature hunting, fishing and outdoor recreation items, along with gift certificates and other great prizes donated by event vendors and friends of the Foundation. Two of this year’s featured raffle items are a .308 Ruger M77 Bolt Action rifle, #133 of the engraved limited edition Fish and Game 150th Anniversary Commemorative Rifle series, and a queen-sized wildlife quilt. There will also be a silent auction for two unique items – an Orvis TLS Power Matrix 905 fly rod with an Orvis Battenkill Mid Arbor II disc reel, and a watercolor print of fishing on a river by renowned artist Ogden Pleissner. A separate auction will feature a guided kayak fishing trip with Hope Eagleson. The raffle drawings will be held at 2:30pm. This is the 8th year the Foundation has sponsored this fun family day, a great way for families to explore NH’s outdoor traditions. See live animals, big fish, trained falcons and retrieval dogs. Children can try their hands at archery, fish casting and fly-tying and air rifle. And be sure to stop by the Foundation’s tent and check out all the exciting raffle items and learn more about how the Foundation supports the programs of NH Fish and Game. 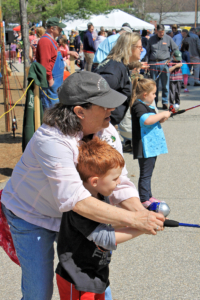 Discover WILD NH Day is an annual family event of NH Fish and Game, held on the grounds at Fish and Game Headquarters at 11 Hazen Drive in Concord from 10:00 to 3:00. ADMISSION IS FREE! For more event information, go to http://www.wildlife.state.nh.us/events/dwnh.html.